Apple recently released a new iPad commercial titled – iPad is Electric. Similar to previous iPad ads, iPad is Electric displays single-word descriptions of the device including; cinematic, elementary, academic, full-size, presenting, bought, sold, fantasy, and electric. Check it out below. Apple has released a new iPad ad. The commercial is titled ‘iPad is Musical’. It highlights nine aspects of the iPad giving each a title; medical, live, musical, work, play, memories, social, magazines, and historic. Check it out below. Today, Apple released four new iPhone 4 ads; Meet Her, Haircut, Smile and Big News. 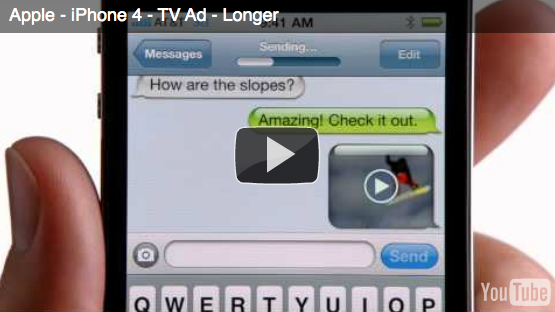 All four commercials demonstrate the FaceTime feature of the iPhone 4. Personally, I’m not a huge fan… check them out and let us know what you think. Apple has posted a new iPad commercial to it’s YouTube account. The video helps answer the question most people ask about the iPad, why do you need one? What’s interesting is the comparison of this commercial to a commercial from Apple back in the 90’s for the Newton. Check out both commercials below. Apparently Apple was not too happy about a recent iPhone commercial spoof Ellen Degeneres did on her show. After releasing the commercial she quickly appologized on her show. The commercial is pretty funny and it is kinda true of how some people react to the iPhone. What do you think? Funny? True? Lame? Apple has released a new iPhone commercial – Family Man. The commercial highlights the ability for the iPhone 3GS to capture and playback video as well as a few applications from the App Store (see list below). I don’t know about you but, this commercial is soooo true for us! The grandparents really do like to see the videos, I totally use my iPhone all the time for cooking, our kids love to play games and watch videos and Doug uses his for everything (I’ve seen that guy do some pretty crazy things from his iPhone)… I’m pretty sure it never leaves his hands. Doug just downloaded iCam today and it’s pretty cool… I’m totally using it to watch my three year old while he is taking his nap (or at least he is supposed to be!). Apple’s latest iPhone commercial, Family Travel, focuses on the iPhone’s ability in making “family travel” much more convenient. Apple recently released “First Step,” an iPhone commercial displaying the ability to take, send and play video as well as the ability to conference call with ease. Apple has recently released a new commercial titled “12 Days of Christmas.” The commercial is based on the classic Christmas song The 12 Days of Christmas and features 12 Holiday applications. Below is the commercial and the list of the apps featured in the commercial. The app list comes via MacRumors.